Remediate personal information to drive insight and compliance with IBM StoredIQ IBM® StoredIQ Suite helps you address the problems that challenge your records management, electronic discovery, compliance activities, storage optimization and data migration initiatives. By providing an in-depth assessment of unstructured data where it resides, this software gives organizations visibility into data to make more informed business decisions. IBM StoredIQ for Legal provides a platform that streamlines eDiscovery for legal stakeholders by providing an organized, systemic approach to eDiscovery. [Benefits] - Provides in-place data management | In-place data management enables an organization to discover, recognize, and act on unstructured data without moving it to a repository or specialty application. - Includes powerful search | Delivers a powerful search function designed to accelerate the understanding of large amounts of unstructured content. - Simplifies analysis | Provides simplified and detailed analysis of large amounts of corporate data. Analyzes and manages data in-place which lessens the impact traditionally associated with moving data between locations. - Provides actionable intelligence | Empowers your enterprise with actionable intelligence that supports many different policy actions such as copy, delete, move, copy to retention or export. - Regulatory Compliance | In-place data management capabilities help enhance your efforts regarding remediation of regulatory and corporate policy violations. - Advanced Data Discovery | StoredIQ GDPR-focused analytics cartridges provide advanced search capabilities specifically focused to discover country specific personal and unstructured data subject to the GDPR. [Key Features] - Automate policy execution across unstructured data: Help reduce risks and lower costs by using IBM StoredIQ Policy to enable your organization as you develop policies to identity, classify and manage enterprise information according to business value. - Identify and act on residual, obsolete and trivial (ROT) data: Delete non-business, aged and obsolete data to reduce data volume and provide full audit trails for all disposal activity. Also reduce risks and storage costs associated with managing large volumes of data - Govern your unstructured and structured data in one place: Through the integration of IBM Information Governance Catalog (IGC) and IBM StoredIQ, achieve the discovery and classification of unstructured data. This unified data governance approach helps organizations find the data they need and evaluate its quality at a glance. "A Powerful foundation for information governance"
IBM storedIQ solution basically helps in structuring large unstructured data that are scattered across the organization and helps in accessing the relevant information much faster without actually moving it to a repository. Inbuilt ability to support different actions such as copy, delete, move, or export. The solution can be a bit more consistent with the upgrades. The installation of Livelink apis could be a challenge without consulting the documentation to locate the exact jar file. this could be more user friendly. Good one to reduce Cost, Risk & Time in the eDiscovery Process. Helps in simplified analysis of large amounts of corporate data to provide detailed analysis faster and limit the impact on user productivity by analyzing and managing data in-place. Used this for its powerful search function that accelerates the understanding of large amounts of unstructured content. What Data Warehouse solution do you use? Analyze Big Data in the cloud with BigQuery. Run fast, SQL-like queries against multi-terabyte datasets in seconds. Scalable and easy to use, BigQuery gives you real-time insights about your data. Snowflake is the only data warehouse built for the cloud. Snowflake delivers the performance, concurrency and simplicity needed to store and analyze all of an organization’s data in one location. Snowflake’s technology combines the power of data warehousing, the flexibility of big data platforms, the elasticity of the cloud and live data sharing at a fraction of the cost of traditional solutions. Amazon Redshift is a fast, fully managed data warehouse that makes it simple and cost-effective to analyze all your data using standard SQL and your existing Business Intelligence (BI) tools. SAP Business Warehouse is a solution to help you manage business intelligence with business planning and analytical services, reporting, query, and more. IBM PureData System for Analytics is a purpose-built, standards-based data warehouse and analytics appliance that integrates database, server, storage and analytics into an easy-to-manage system. It is designed for high-speed analysis of big data volumes, scaling into the petabytes. Data warehouse automation, replication, integration, ETL, backup and recovery of over 100 Cloud and on-premise applications. Offer a fast, reliable, and cost-effective platform for data warehousing and business intelligence that is easy to scale to meet the complex reporting. With customers and staff around the globe, ZAP provides technology that supports a customer’s journey from data collection and manipulation to the presentation of best practice analytics, allowing organizations to better manage their business at a time when data is both exploding and becoming ever increasingly important. 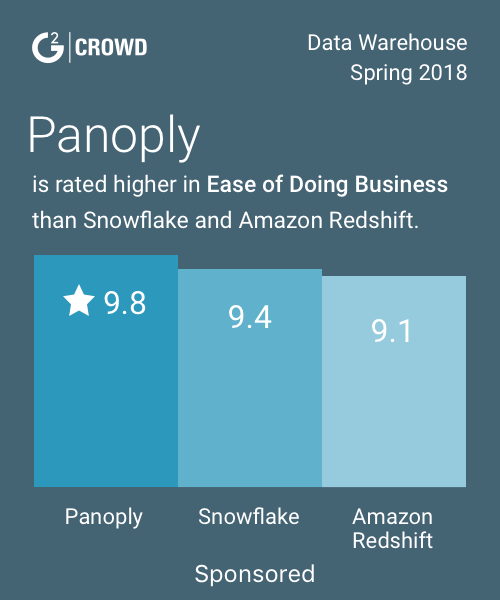 Panoply delivers the world’s only unified, ETL-less Smart Data Warehouse, expediting the journey of migrating raw data to analytics using machine learning and natural language processing. Vertica offers a software-based analytics platform designed to help organizations of all sizes monetize data in real time and at massive scale. * We monitor all IBM StoredIQ reviews to prevent fraudulent reviews and keep review quality high. We do not post reviews by company employees or direct competitors. Validated reviews require the user to submit a screenshot of the product containing their user ID, in order to verify a user is an actual user of the product. Hi there! Are you looking to implement a solution like IBM StoredIQ?